Winter is not exactly my favorite time of the year. Yes, it’s nice to get all cozy and snug in front of a fire when it’s cold outside, and I do love snow, but the lack of sunlight is really getting to me during these long, dark months. However, there are a couple of things that make up for it and can brighten up any day. Really high up on that list, if not on top, are cookies. Not only is it acceptable to constantly be baking (and eating) different kinds of goodies during this time, it’s pretty much expected! While Christmas cookie classics like gingerbread and sugar cookies are great, it takes a long time to roll the dough out again and again, cut out the cookies, wait for them to cool down, and then decorate them. 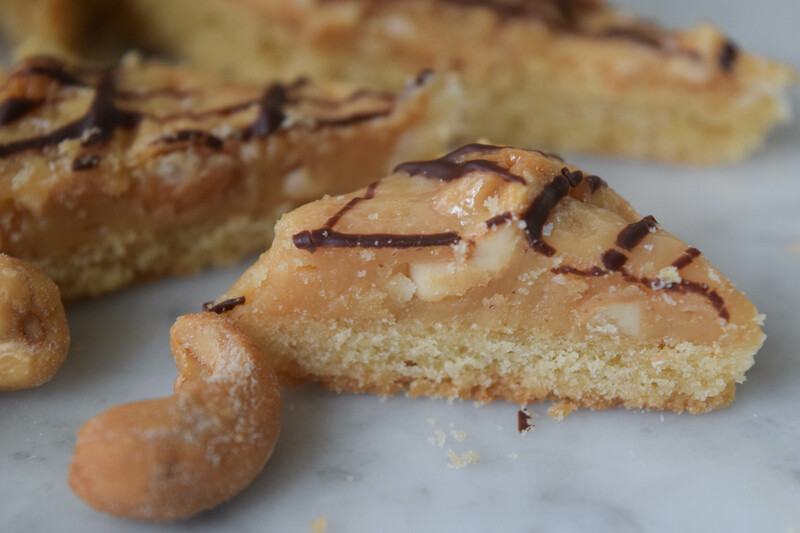 If you don’t have the time or patience for cookie cutters, but want to get in on the baking action, why not try sheet pan cookies? 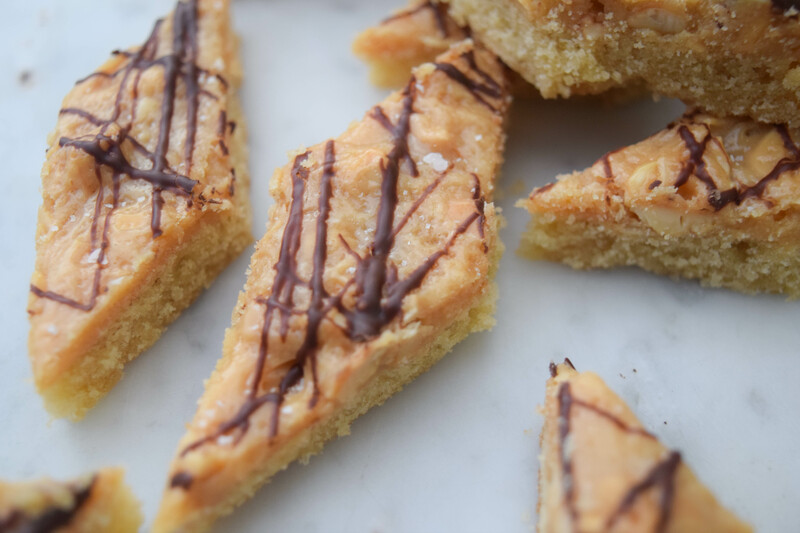 They are equally delicious, but much faster to make, because you only have to roll your dough out once and then cut it into squares or diamonds after baking. 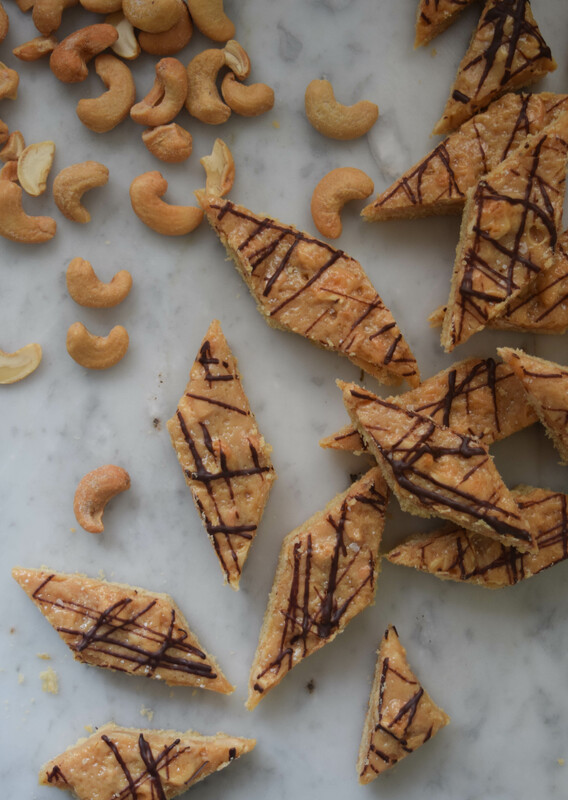 These cashew toffee cookies are quick and easy, but look and taste super sophisticated. 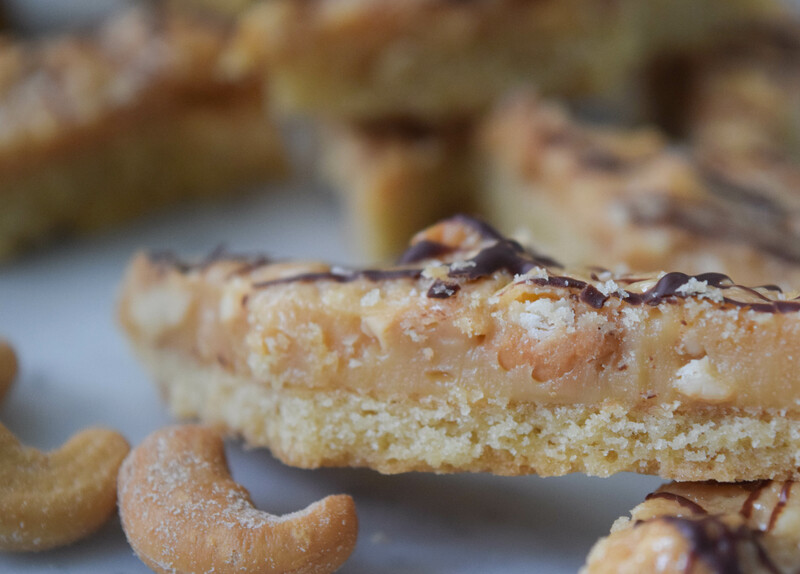 Imagine a melt-in-your-mouth vanilla butter cookie, topped with salted cashews in chewy caramel, sprinkled with kosher salt and drizzled with dark chocolate. Are you salivating yet? My lovely friend Liesi first introduced me to this recipe about eight years ago during one of our Christmas cookie baking sessions. Over the years, I have tried different variations and adapted it a little bit, but I have made it every single Christmas for the past eight years, without fail. It really is that good! 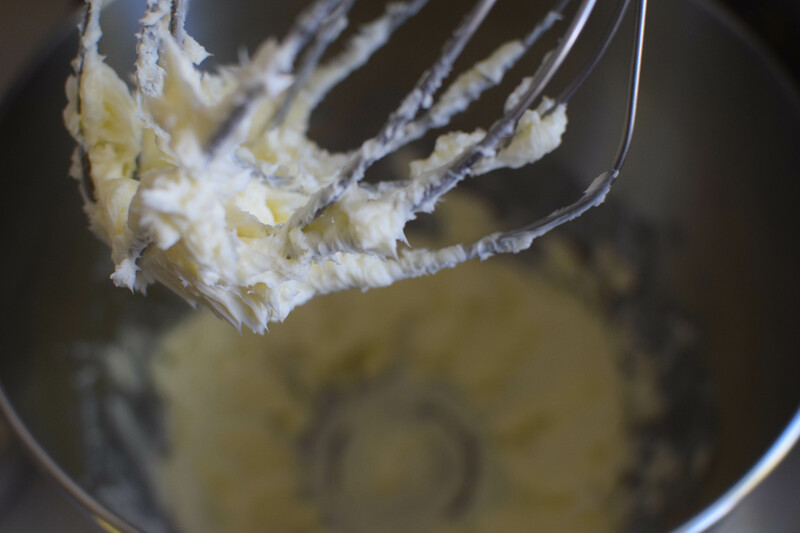 In the bowl of a stand mixer, whip butter until smooth. Add 3 ounces of light brown sugar, 1 egg, 1 teaspoon vanilla extract, and a pinch of salt. Mix until well combined. Line a baking sheet with parchment paper. Place the dough on the baking sheet and lightly sprinkle it with flour. Roll the dough out to a rectangle measuring about 11” x 8.5 ”. Using a fork, poke holes into the dough to prevent it from bubbling up too much while it bakes. Bake at 350°F until the edges are just starting to brown, about 20 minutes. In the meantime, give the cashews a rough chop. Set aside. In a small saucepan, combine sweetened condensed milk, 1.5 ounces of brown sugar, and 1 ounce of butter. Bring to a boil, stirring continuously. Don’t stop stirring, the caramel can burn very easily. Continue stirring while letting the mixture simmer until it starts to thicken, about 5 minutes. Take the caramel off the heat, add 1 teaspoon vanilla extract and fold in the chopped cashew nuts. Spread the mixture evenly on the dough. Continue baking at 350°F until golden brown, about 10-12 minutes. Sprinkle with kosher salt and set aside to cool. To temper the chocolate: Melt 3/4 of the chocolate in a double boiler. Once the chocolate has melted (it should register at about 118°F), remove the bowl from the waterbath and add the remaining 0.5 ounces of chocolate. Keep stirring until all pieces have melted and the chocolate begins to thicken again (it should register at about 90°F). Drizzle cookies with melted chocolate. Set aside to cool completely. Cut off the edges so you have a neat rectangle, then cut the dough into diamonds (first horizontally, then diagonally at a 45° angle) or squares. Tip: To get cleaner edges, wipe any caramel sticking to the knife off with a paper towel between cuts. To make the dough: Whip butter until smooth. Add sugar, egg, vanilla extract, and salt. Mix until smooth before adding flour. Wrap dough in plastic wrap and let it firm up in the fridge for 30 minutes. Roll out dough on a baking sheet lined with parchment paper. Perforate with a fork and bake blind at 350°F until edges start to brown, about 20 minutes. To make the caramel: In a small saucepan, combine sweetened condensed milk, sugar, and butter. Stirring continuously, bring to a boil and let simmer until mixture thickens, about 5 minutes. Remove from heat. Add vanilla extract and fold in chopped cashews. Spread caramel mixture evenly on dough. Bake at 350°F until golden brown, about 10-12 minutes. Sprinkle with kosher salt. Set aside to cool. Melt 3/4 of the chocolate in double boiler. Temper with remaining chocolate. Drizzle chocolate over caramel. Let cool completely. Cut into diamonds or squares. 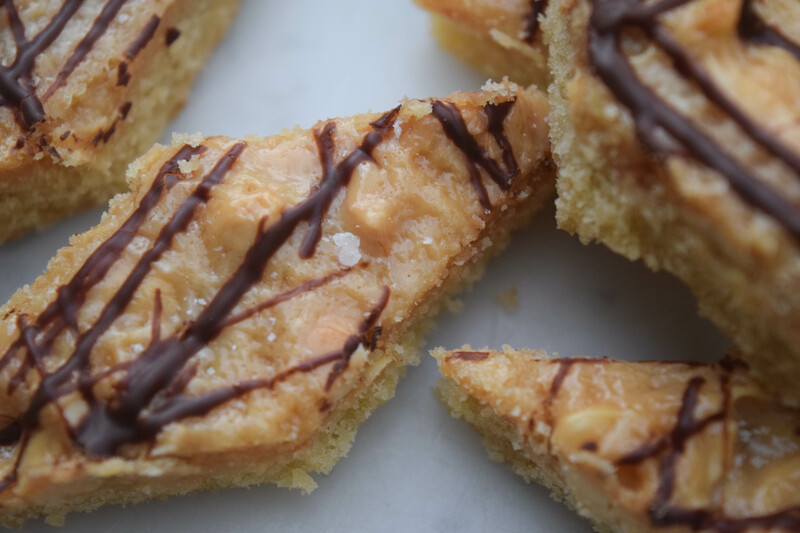 I’ve definitely added your recipe to my must-bake-cookies list for Christmas! Yes, those were the same ones, minus the chocolate. (They are my favorites, too!) Let me know how they turn out.